Is butter healthy? The answer may depend on who you ask. Some experts believe butter is healthy because it is made from dairy and is a better choice than alternative fats like margarine or oil. But other The nutrition data can help you to see how it might fit into your complete meal plan. There are no carbohydrates in butter, making it a low-carb, low-glycemic food. The calories in butter come from fat. While there are different types of fat in butter (including healthier forms of fat, like polyunsaturated fat and monounsaturated fat) most of the fat is saturated fat. A single serving of butter provides no protein. You'll benefit from a small amount of vitamin A when you consume a pat of butter. Butter has become a trendy food in some circles and some butter eaters promote higher fat consumption. Ketogenic dieters, for example, and some others who choose a low-carbohydrate eating plan may add butter to many foods throughout the day to increase their fat intake. But you won't gain many health benefits when you add butter to your meal. Butter is high in saturated fat and doesn't provide any substantial vitamins or minerals. Most health experts still recommend reducing your intake of saturated fats, like butter. 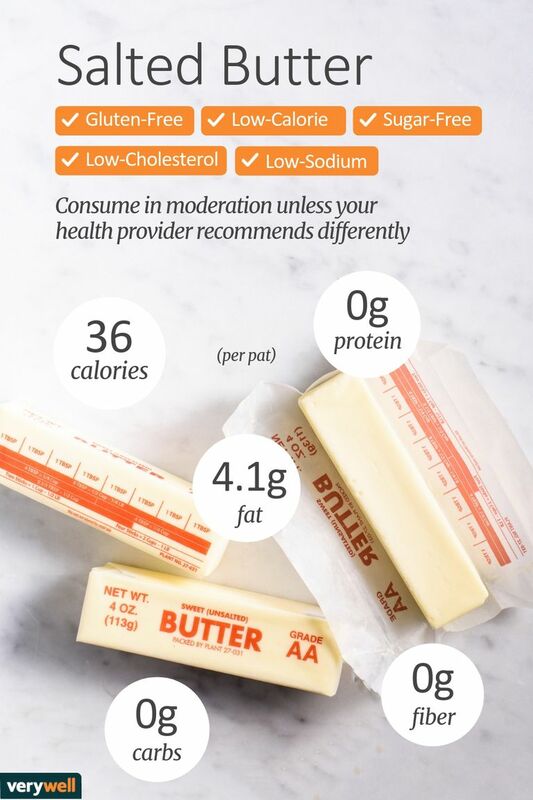 So it's smart to consume butter in moderation unless your health care team recommends differently. However, like many forms of fat, butter is satisfying. Some diet experts believe that eating a small amount of satisfying fat is better than consuming larger quantities of fat-alternatives that are less satisfying and may include processed ingredients. In some cases, the butter-alternative may increase your daily calorie and fat intake more than butter. But even if real butter is more satisfying, it is important to keep portion control in mind. A "pat" of butter—the pre-cut serving size that you find at many restaurants (listed on the label)—may only provide 36 calories and 4 grams of fat. But the more common serving size of butter, one tablespoon, provides 100 calories, 11 grams of fat and 7 grams of saturated fat. The butter versus margarine debate can be a tricky one to resolve because there are many different margarine products on the market and each has a different nutritional profile. There are "heart-healthy" margarine brands, for example, that claim to include healthy fats, such as omega-3 fatty acids. A smart way to evaluate your favorite margarine product is to check the Nutrition Facts label and the ingredients. Margarine is often made from vegetable oil, so you may see that there are fewer grams of saturated fat listed on the label. But many brands of margarine also contain trans fat. You'll see it listed as "hydrogenated oil" or "partially hydrogenated oil" on the ingredients list. Health experts recommend that you reduce or completely avoid consuming products with trans fat. Butter buds or sprinkles made from maltodextrin, butter, and salt. Provides ten calories and 60 milligrams of sodium per teaspoon. Butter spray is made from water, soybean oil, salt, and other ingredients. According to the label, it provides zero calories and zero grams of fat, BUT, a single serving is 0.2 grams which might be impossible to measure. For perspective, a 12-ounce bottle of butter spray provides 1700 servings. Light butter spreads made from butter are often lower in calories because they are puffed up or lightened with ingredients like water and/or maltodextrin so that you use less. A light butter product provides approximately 50 calories per tablespoon, 6 grams of fat and 3.5 grams of saturated fat. There are also natural alternatives to butter and butter substitutes. The product you choose may depend on how you plan to use it. Avocado is often called "poor man's butter." It makes a great spread on toast and is a good source of healthy fat. Peanut butter brands vary, but a natural peanut butter provides no added sugar or trans fat and can boost your protein intake. Olive oil is a good substitute for butter if you use it to saute meat or vegetables. If you use butter to top a potato or vegetables, fresh herbs can be a healthy, no-calorie substitute. Chives or tarragon can give foods a fresh savory flavor. Add a squeeze of lemon if desired. You can use plain jam or jelly on toast, pancakes or French toast instead of butter, but fresh fruit is healthier. Spread ripe banana or layer thinly sliced strawberries to get healthy sweetness without added sugar. Do you usually fry or scramble eggs in butter? Use a non-stick pan instead and eliminate the butter altogether. You'll be surprised that eggs can be just as delicious without the added fat. What's the nutritional difference between salted and unsalted butter? When you buy butter, you can choose from salted or unsalted varieties. So what's the difference? Not much, except for the sodium levels. Butter calories do not change depending on the salt content. If you choose the salted variety, the sodium level may vary from brand to brand due to manufacturing methods. Both Land O' Lakes and Breakstone's Salted Butter each provide 90 milligrams of sodium per tablespoon. The unsalted varieties provide zero grams of sodium per tablespoon. Keep in mind, however, that if you buy the no-salt variety to reduce sodium in your diet and end up sprinkling more table salt on your food as a result, then you may be doing more harm than good. Storing butter is fairly simple. Some people keep butter on the kitchen counter, so it is soft and easier to spread on toast and other foods. But butter makers recommend that you refrigerate the product in accordance with USDA and FDA guidelines. Butter can be frozen for up to four months from the date of purchase. It should be frozen in its original container. Once thawed, it should be used within 30 days. If you avoid dairy for any reason or if you have a diagnosed dairy allergy, you should avoid butter. Common symptoms of dairy allergy can include mild reactions such as hives or more severe symptoms including trouble breathing. According to allergy experts, symptoms can even be life-threatening. Keep in mind, that baked goods and other products that contain butter may also cause a reaction. If you are unsure about your dairy allergy and are not sure if you can safely consume butter, check with your healthcare provider.